Alli is the lower-dose version of the weight-loss drug Xenical (orlistat) and is manufactured by GlaxoSmithKline. It has been available in the U.S since June 2007 without a prescription and is widely sold in pharmacies there. It recently received authorisation from the European Medicines Agency to be sold across Europe without a prescription. The Online Clinic does not currently have any plans to sell this medication as it will be obtainable without a doctor's prescription from your local pharmacy. We can continue to prescribe the higher dose version of orlistat, which is more effective but must be taken under the supervision of one of our doctors. We can prescribe 120 mg of Orlistat in the form of Xenical. 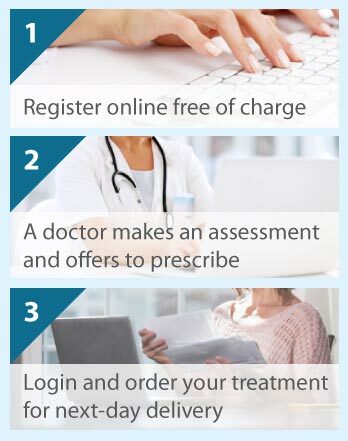 Before you can purchase Xenical (orlistat) you must complete a consultation form to be checked by one of our doctors. The medical name of Alli is Orlistat. Orlistat works by inhibiting an enzyme in your digestive system called a lipase. Lipases normally break down dietary fat which allows the fat to pass into your blood stream. When the action of the lipases is blocked, this means some of your dietary fat is not broken down and so passes out of your body in your faeces. What is the difference between Xenical and Alli? Xenical and Alli are made from the same drug, orlistat. The difference is that one capsule of Alli is only half the dose of a capsule of Xenical. As Xenical is stronger, it is still only available with a prescription from a doctor. As Xenical is a higher dose than Alli, it is unlikely to be as effective. However GlaxoSmithKline say that while taking Alli, you may absorb up to 25% less dietary fat. Clinical trials have also shown that patients may lose up to 50% more weight than they would through dieting alone. Alli is intended for people who are obese or significantly overweight. It is a pharmacy only medication and it should not just be taken because you need to lose a few pounds quickly. Pharmacists should check your weight and medical history before allowing you to purchase it. It is not suitable if you are allergic to Orlistat or any of the other ingredients in Alli. It is also not suitable for you if you have a liver disorder, problems absorbing nutrients or if you are breast feeding. Orlistat can cause some very unpleasant side effects if patients do not follow the dietary advice of the manufacturer, namely to stick to a moderately low-fat diet. Side effects can include uncontrollable bowel movements, oily stools and flatulence. It can also cause tiredness, or bloating. This is not an exhaustive list of side-effects and the full list can be found on the manufacturer's notes which accompany the medication. What must be emphasized is that most people take Orlistat without having any side effects whatsoever. Orlistat is a generally well tolerated medication so long as the dietary advice is observed.